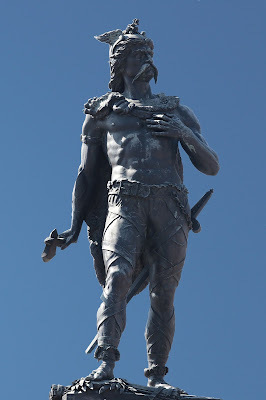 Ambiorix was king of the Eburones, a Gallic tribe that lived between Meuse and Rhine. Today that area covers most of Belgium, Luxembourg and the south of the Netherlands. In 57 BC Caesar freed them from the Atuatukers. But later, after a failed grain harvest in 54 BC. there was tension between the Eburones and their Roman 'liberators'. Caesar had murdered the Celtic leader Dumnorix. The Treviri, a tribe from the Moselle valley, was ready for a large-scale Gallic uprising against the Roman empire. They wanted to use Ambiorix as a distraction. One night the Eburon king attacked the Roman winter quarter of the 14th legion. That attack failed, at least, it seemed like that. But it actually fitted in the distraction plan. The camp commanders, Cotta and Sabinus, asked Ambiorix what inspired him. Why did he attack them? They were friends after all? By the way, what could he do with his limited troops against the Roman superiority? Ambiorix cleverly replied that he could not but attack, because he felt obliged to cooperate with the Gallic plan for a major offensive. The officers thanked Ambiorix for the warning and the other Roman garrisons in the neighborhood were warned about the upcoming revolt. They broke up their tents and left. En route, in a narrow valley, Ambiorix lured them into a trap. He attacked, and his guerrilla techniques gave the Romans the greatest defeat in the entire 'Bello Gallico', the Gallic War. 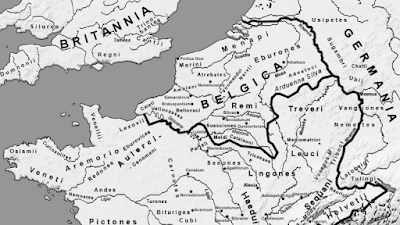 Afterwards, Ambiorix and his Eburones together with the Nervians, the Atuatukers and the Menapians attacked another Roman garrison in the Meuse valley. 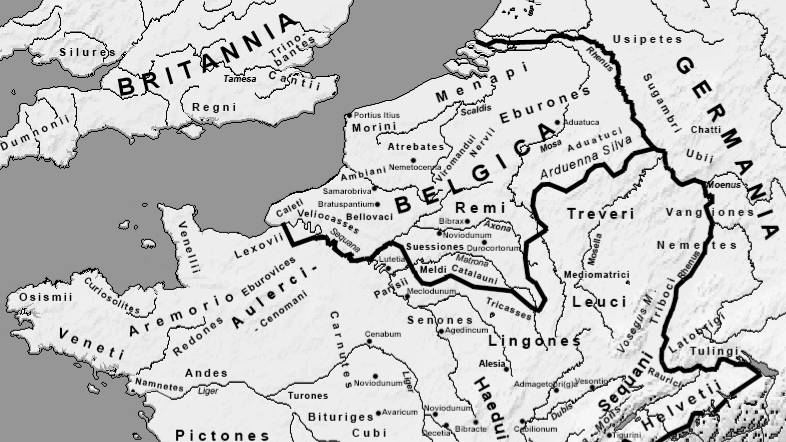 Julius Caesar wanted revenge against the 'Belgae', as he called the Celtic tribes in North Gaul. The revenge of Caesar was extremely bloody. Some historians compare it with a genocide. The country was destroyed, men were killed, women and children were taken away as slaves. 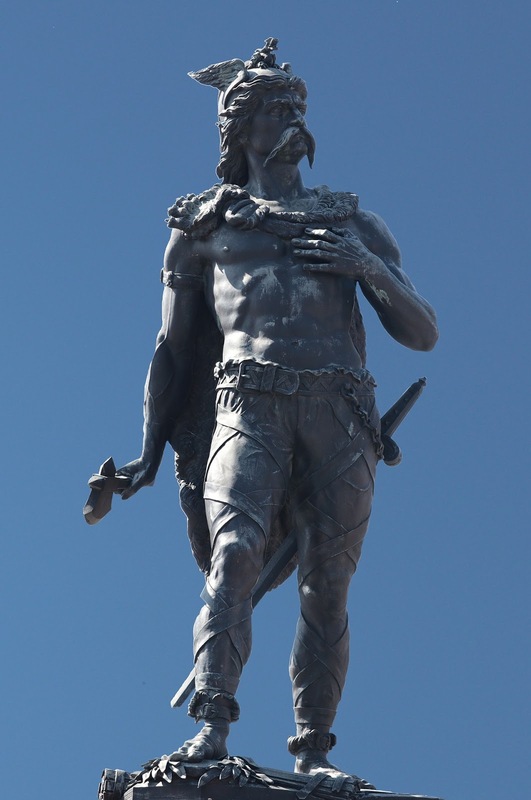 One of the few warriors who escaped the strangulation was Ambiorix. He crossed the Rhine and sought a safe shelter with the Germans. Ambiorix 'statue has been standing on the Grote Markt in Tongeren since 1866, it the oldest city in Belgium. Also the Belgian Gallo-Roman museum is located there.